The New England Patriots Are Super Bowl Bound in a Rematch of the Century! In what had to be one of the most nerve-wracking playoff games I’ve seen in a long time, the New England Patriots defeated the Baltimore Ravens 23-20, clawing their way to their 5th Super Bowl in 11 years. It was a true example of old school NFL defense versus new school NFL offense, and these teams were two of the best examples of each. Tom Brady led the best offense in the NFL to another Super Bowl appearance even though his stat line wasn’t too appealing. He finished 22/36 for 239 yards, with 2 INTs and no touchdowns. Through most of the game, Baltimore’s defense was holding the Pats to field goals and made the most out of their turnovers when it counted. It was a game of inches and both teams had their fair share of bad plays. From Woodhead fumbling on the return kickoff, to Flacco throwing an interception to Brandon Spikes late in the game, both teams had plenty of plays they wish they could have back. For New England, it had to be a long interception batted in the end zone and picked off from the bad play action pass. The Pats took the ball late into the 4th with a 3 point lead and had a chance to run the clock out, but were forced to punt back to Baltimore with 2 minutes left. The Ravens drove far down the field and put up a hell of an effort to almost win the game outright. Flacco attempted to hit Lee Evans in the end zone with 30 seconds left, which would have cemented a victory for them, but Sterling Moore broke up the sure touchdown. Instead, they had to call in Billy Cundiff for a 32 yard field goal to tie the game and send it into overtime. And like a scene out of a movie he shanked it wide left and gave the Pats a win. I haven’t seen someone choke so bad since the Yankees in 04. They went from almost winning the game, to losing the game in a matter of seconds. But looking back on it, I couldn’t be more proud of the Pats with this win. Tom Brady said it himself, he came out and played badly. He threw 2 picks, and didn’t register a touchdown, his first game without one in 36 games. But the rest of the team stepped their game up and won this game for #12. He single-handedly won us games in the regular season, but this one was a team effort. From Wilfork causing constant pressure on Flacco, to Spikes interrupting the run and getting a huge interception, and BGE running effectively early on. The defense did exactly what they had to, and held the Ravens to only 20 points all game. Did the Ravens blow the game? Absolutely. They could have had a touchdown late, and they should have had a field goal to tie it, but they blew both. But I’ll take it, and so will the Patriots. And in another nail biter with equally crazy plays, the New York Giants defeated the San Francisco 49ers to win the NFC Championship. This is the rematch of the century, as New York was the only team to beat the 2007 Patriots, in the Super Bowl, in the final seconds. That game is still fresh in all of our memories, and I expect the Pats to be fueled up to avenge that loss. We have two weeks until then, and we’ll need it to prepare. The Giants beat us in a heart breaker at home earlier this year, but we’ve won 10 straight since. I know for sure the Pats will outscore the Giants, that isn’t even a question. 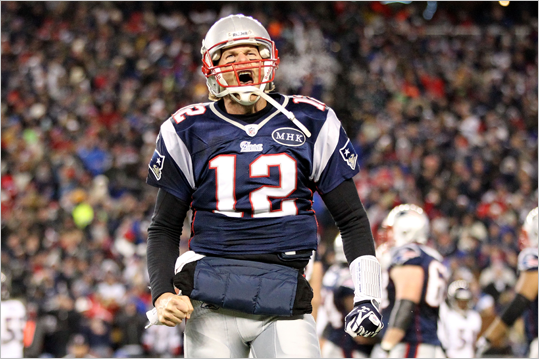 The whole team seems hungry, and Brady is gonna come back with a vengeance after his lackluster performance. * Tough day for the Harbaugh family, huh?